The young witch Grimelda is deep in the mire: All she wanted to do was dye her hair, but a tiny drop fell into her aunt’s magic cauldron! Now the whole beautiful forest is full of nasty, sticky ooze, endangering the villagers! If her aunt comes back and sees what happened, she'll be in real trouble. Will you help Grimelda out of this mess in a magical Time-Management adventure? 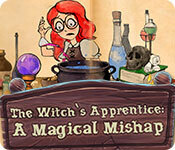 The Witch's Apprentice: A Magical Mishap is rated 4.6 out of 5 by 12. Rated 5 out of 5 by cleep100 from So Fun! I wasn't expecting too much from this game, but once I got into it, I was hooked! Excellent replay value. Rated 5 out of 5 by layzeedaisy from Great fun and slightly different I am thoroughly enjoying this TM game, it has a nice story line. It gets more strategic as one progresses through the levels but that is to be expected. I thought - as I had only bought the SE - that the crystals were for the CE only as I couldn't find a red crystal anywhere. It wasn't until level 35 that I accidentally collected a crystal and the find was reported in the end of level summary. Now that I know they're white (!!!) I've gone back over all the levels just to collect the crystals. As a result - surprise, surprise, I now have extra bonus levels to play. I believe TSTROH24B had the same problem. I hope there are more additions to this series unless they get really silly like Moai did and became impossible. Rated 5 out of 5 by McKoehn from Nice colors, fun details. Thank you for another great time management game. Love the colors, very bright and appealing, and very cute graphics. Thanks! Rated 5 out of 5 by almostanangel from Just enough challenge and a lot of fun! I'm a longtime lover of time-management games, but I often get tired of them because they're easy bogs of point-and-click boredom, or in a few cases because they're impossible. (Settlers of the West, I'm looking at you...) This game was just right. Give it about half a dozen levels and you'll notice that you need to have a strategy to win, not just a fast mouse. My only minor gripe was that the power-ups weren't explained - you have to hover your mouse over them for a few seconds before the script pops up telling you what they do. Still, I'm likely to go buy the CE next because I'm addicted! Rated 5 out of 5 by cowclaudia from Fun Am thoroughly enjoying this game - certainly mental relaxation after complicated time management and hidden objects. Poor little witch fouled up the magic potion so has to gather resources and gems to put it all right. Tutorials are very helpful and you don't have to sit there wracking your brain wondering what to do next or having to buy a collector's edition to get a strategy guide. My only complaint is that I don't like playing with a full screen and unfortunately even with clicking the button can't get it to go to windowed mode but that's a minor issue. Rated 5 out of 5 by Marshakt from Cute and fun Thought this one was cute and fun. Rated 5 out of 5 by pennmom36 from THE WITCH'S APPRENTICE IS AN INCREDIBLE TIME MANAGEMENT GAME The Witch's Apprentice has made it to the top of my personal favorite's of a TM game. 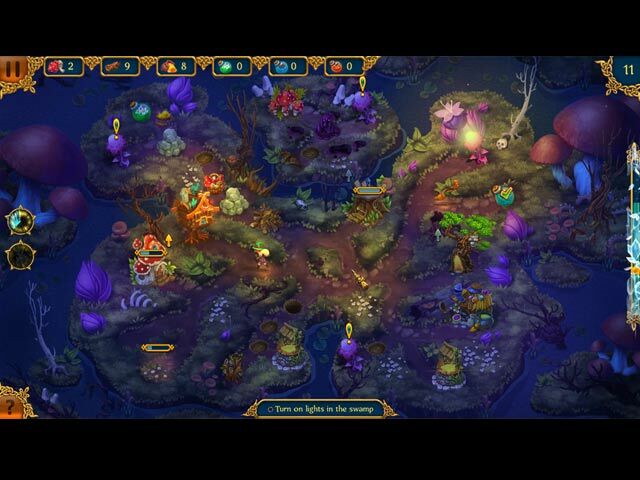 The graphics are gorgous, the tasks are really fun, the storyline is super funny. I liked this game so much so, that I purchased the CE version because I just couldn't wait for this SE version, and I'm anti-CE when it comes to a TM game! After playing both versions, I really wish I'd waited because this version still offers High Score Boards, 13 Trophies to earn, and 40 Collectible Crystals (1 hidden in each level) This version also still offers the Bonus levels that can only be unlocked by earning 10, 20, 30 and 40 Crystals, and those Crystals can also still be used to clean the Witch's Hut! The only thing you don't get with this version is 3 cartoon Wallpapers and a built-in Strategy Guide, boy I sure wish I had waited! You can play in an Easy (untimed) Normal or Difficult mode, which is a plus nowadays because the new trend seems to be gearing towards a single mode TM game. The goal is to earn 3 Stars, and any level can be replayed, in fact, you can switch between modes if you'd like, and the High Scores Leaderboard is available to view on the pop-up Score window after each level completed. The goals are different than most TM resource games, you'll clean up Purple Ooze, gather Stardust, Tree Bark, and Mushrooms which are the ingredients that are used to make potions within the Witch's Hut. There are different Potions available, such as a Healing Potion of Life to cure the sick animals, a Potion of Restoration, and a Potion of Destruction to clear away boulders and other obstructions. Bonuses are available that will help you win the harder levels, such as Speeding up Workers (which happen to be Magic Brooms) Accumulate Resources and one that regenerates renewable Resources. I like the fact that the Bonuses not only alert you when they have recharged, but it also allows you to use both of the available bonuses at the same time if you want. Usually, you have to wait until the meter fills up to the second bonus and then you can only choose one or the other. This is a super entertaining TM game with unusual tasks and resources. I loved absolutely everything about this game, but I definitely think that this Standard Edition version is the best option, unless you want to pay twice as much just to get 3 Wallpapers and a Strategy Guide? Enjoy the purple ooze fiasco! 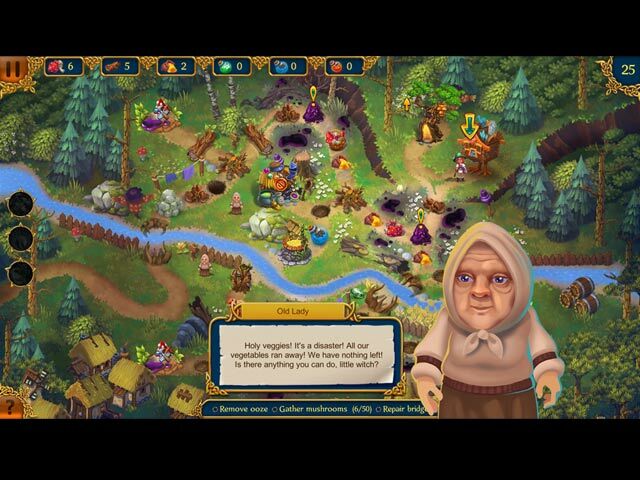 Rated 5 out of 5 by joybelle_1 from Great gather resources game I bought the CE version of this game and it is a great quality "gather resources" game. It has all the elements we "time management" crew expect including a reasonable amount of challenge Considering games in this genre are pretty hit and miss these days..dont miss this little bit of fun. Rated 4 out of 5 by luverrly from Fun I don't tend to play too many time management games, but after playing the trial version had to buy this one. Just hard enough to be challenging, but not too difficult that I want to give up. The story line is also engaging and funny which makes me want to know what happened next. Also fun to replay and do again once finished. 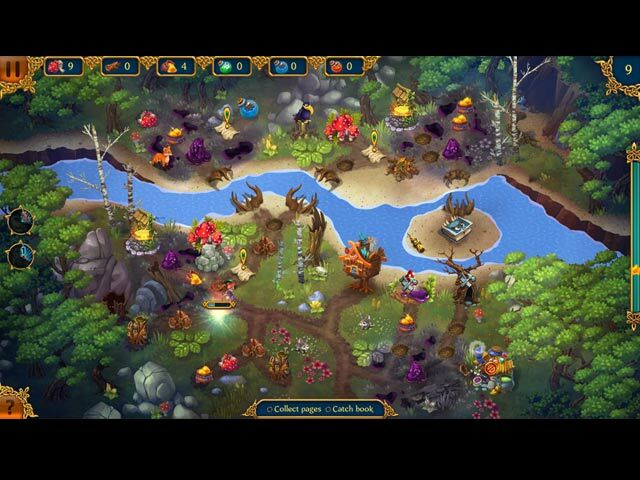 Rated 4 out of 5 by Scottar from Addicting Colorful Game This is a cute game for the young witches and goblins, but also a great time waster for adults when doing the strategy on many levels. In fact your kids may drag you into it to help solve some levels. It's colorful and has good graphics. The music is OK too. What is missing is an achievements section other then scouring. You restore the witches hut as you progress though the levels in any proficiency level, casual to expert. As you complete every section you then have access to the bonus level in that section. Join Grimelda and her hard-working brooms on a magical time management adventure. Can you clean up the forest before Grimelda's aunt comes back?